Special watercraft allow anyone to ride the wild Snake River through North America’s deepest canyon. 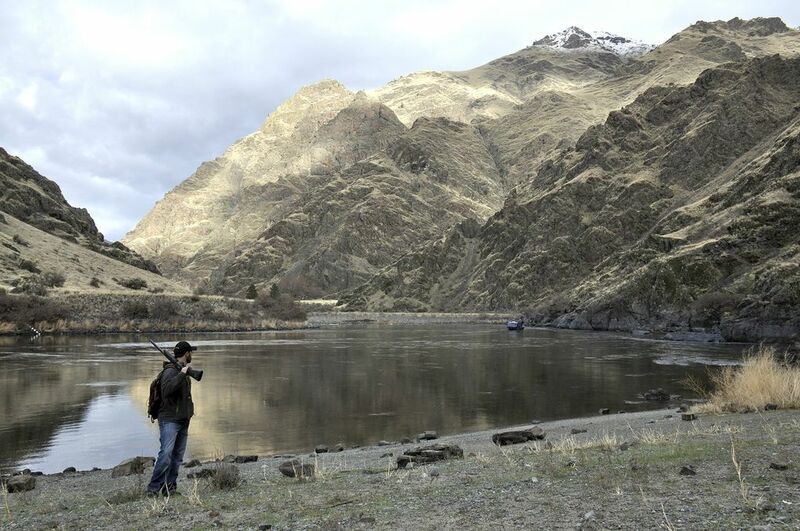 WHITE BIRD, Idaho — Hells Canyon might be God’s best-kept hideaway if you’re a hiker seeking solitude, a hunter pursuing game or an angler hoping to catch smallmouth bass, steelhead and sturgeon until your arms are numb. Jet-boat operators provide the divine intervention to answer your prayers. The Snake River is the freeway to the canyon experience. Starting from Hells Gate State Park in Lewiston, Idaho, boaters can navigate 104 miles of wild country upstream to Hells Canyon Dam. They can, that is, if they have the skills to negotiate rapids that range to Class 4-5. But with a skilled pilot in a properly outfitted jet boat, with no propeller to strike rocks, Class 4-5 is defined as family fun. “We just had our first trip of the 2015 season (on a recent Thursday),” said Heather Killgore, who started Killgore Adventures with her husband, Les, and son, Kurt, in 2002. The Killgores also raise longhorn cattle, guide deer hunters and host long-range shooting events. But they are best known for their year-round jet-boat tours in the canyon’s wilderness core — the 32.5 river miles from Pittsburg Landing upstream to Hells Canyon Dam. “The whitewater is just part of the experience,” Kurt Killgore said during one of his popular tours through North America’s deepest canyon, about 8,000 feet if measured from the Snake River’s Granite Creek Rapid up to the summit of He Devil Peak, elevation 9,393 feet. Jet boat tours might involve stops at historic sites along the river, including Kirkwood Historic Ranch and Museum. Lunch might be at Hells Canyon Dam with a visit to the Forest Service visitor center. 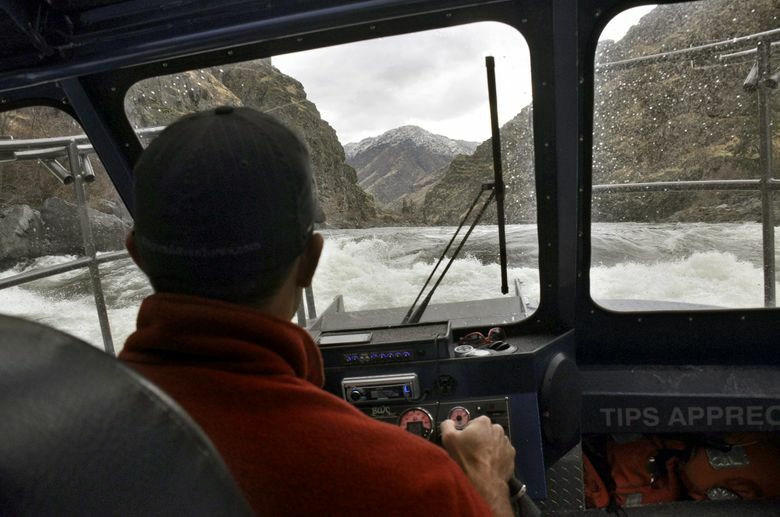 About 15 jet-boat operators are licensed to operate in Hells Canyon. During summer, jet boats are allowed to run Thursdays-Sundays while other days are reserved for nonmotorized boating, primarily rafters and kayakers heading downstream on multiday trips from the dam. Kirby Creek Lodge, Kirkwood Ranch, Temperance Creek Ranch, Sand Creek Fish and Game Cabin and Sheep Creek Ranch — all remote and most accessible only by boat or trail. Slowing the 30-foot jet boat to a purr on a stretch of smooth, deep, dark water, Killgore baits a rod and casts it out with enough weight to knock a black bear silly. About 20 minutes later, Holmes — muscle weary and dampened with sweat — reeled up a 6-foot-long sturgeon. “Think what it would feel like to land one of the 9- or 10-footers,” Killgore said before they released the gentle giant. The trip includes seven major rapids that must be negotiated up and downstream, including two Class 4s that can range to Class 5 — Wild Sheep and Granite Creek. Although he has two 550-hp engines at his service, Killgore doesn’t just roar up the frothing waves of Granite. He gets partly into the deafening rush of current, eases off the throttle, side slips off a pillow of water and then eases down on the lever to power tons of aluminum and eight guests over the top.